So writes Michael Noonan (edgetraderplus.com) in edited excerpts from his original article* entitled Gold And Silver – Newton’s Third Law Is About Ready To [Over]React. Be Prepared. [Over the past few months] JP Morgan, in concert with others, has been…suppressing the paper market by naked shorting tens of thousands of contracts…[in an effort to] scare everyone out of the gold and silver market. It worked, in a small part, pretty much destroying the futures market, yet it failed on a grand scale by attracting world-wide pent-up demand for bargain prices! The natural law of supply and demand has been unnaturally distorted, and the fiat buzzards are about to have their paper asses handed back to them, with their heads still up there. The final push to keep PM prices artificially low has created such a tightly coiled spring that once the pressure lets up, or is forced up, the reaction is going to push gold and silver to levels unknown that will be equal and opposite to the misplaced energy keeping them down [thanks to the effects of Newton’s Third Law Of Motion which states that to every action there is always an equal and opposite reaction…. Leave to central planners to convert the Law Of Supply and Demand to “Unintended Consequences”! All government, Keynesian, and central planner idiots have abused Newton’s Third Law Of Motion profusely, and at the expense of the masses, throughout history. Every once in awhile, though, it catches up to them and we stand fortunate enough to be the beneficiaries. Let no one ever forget that the Fed, a privately held corporation NOT under US control, (but in total control of the U.S.), was modeled after the Weimar banking system. The Weimar banking system was designed for one purpose and one purpose only, to enrich the bankers at the expense and destruction of the German economy. Mission accomplished. The Weimar banking system was imported to this country in 1913, when the Federal Reserve Act, a mirror of the Weimar banking system, was passed. The privately owned federal reserve was established for one purpose and one purpose only, to enrich its owners at the expense of the U.S. economy. “Mission accomplished,” as Bush Jr. would say. None of this matters, any more. Either you see the handwriting on the wall or you do not. Can there be yet one more push to the downside in PMs? Yes. Will there be? The odds of that suicidal banker event diminish with each passing day. Do not play Russian roulette with the timing of your purchases, anymore. In fact, the Russians, (and the Chinese, and the Indians, and the Turks, and the Arabs) have been the willing beneficiaries of this blatantly stupid move by Western central bankers to scare people away from owning precious metals. As far as the futures and their artificial prices are concerned, the bear market is starting to fray around the edges. For the first time in months, we opted to go long gold in futures. It may be just a short-term trade, but the signal to buy was clear. Futures have not signaled a definitive bottom, but we are of the solid belief that the physical market may soon become the more accurate pricing mechanism. There is one trading scheme that calls for a buy and hold whenever price rallies and closes at the highest level in a four-week period. That is a mechanical process, but one for which we have some degree of respect within the context of developing market activity. It is no accident that gold was able to rally as strongly as it did , and have that rally fall in line with the 4 week higher close scheme. It is something we will continue to watch. It is possible that another level of absorption may be forming, in the second box. Price activity will confirm or negate that, possibly next week. The argument for silver is not as compelling, chart-wise, as illustrated below. 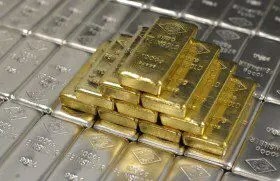 It looked like silver was signaling earlier than gold, in the past month, and note was made of its high volume, strong close, at the end of June, similar to gold fourth chart, making several observations about it [see here]. Will gold pull silver up, or will silver act as a drag on the current rally in gold? Each has to be viewed separately for decision-making purposes. Right now gold is favored, and it would be a mistake to buy silver over gold in the hopes it will catch up. Buy silver futures when developing market activity signals a buy, as occurred in gold. We choose now for buying and holding physical gold and silver. We are on the long side in gold futures, but that can change on any given day. The window of opportunity to buy physical gold and silver continues to narrow. Like the housing market top was known to be coming, when it came, those who waited too long regretted it. When the bottom for the physical PMs is known as a certainty, those who waited for a “better price” may also regret that decision. It is all about choice. 2. Noonan: Silver Charts Suggest This Could be the Bottom! 3. Noonan: Charts Suggest NO Ending Price Action In Either Gold or Silver – Take a Look! 10. Spend Your Bernanke Bux Now on PHYSICAL Gold & Silver! Here’s Why! 11. Gold & Silver vs. Fiat: Do You Live In An Imaginary World Or In Reality? There are now too many other BIG fiscal “players” in the global marketplace for the USD to continue to stay THE worldwide standard forever; and when little by little deals are made in other currencies, the USD will begin to slip at which time PM’s and their value vs. the USD, will also change dramatically in what I call the upcoming US Dollar Tipping Point. Depending upon what causes the shift in the USD’s value (a War vs a new ongoing resource transaction for oil sales), PM’s value will respond accordingly! Think of this as a One-Two combination fiscal punch that will leave those holding only USD reeling, while at the same time only those still holding PM’s will remain much more secure than ever before. I believe the practice of selling naked shorts (buying Gold with freshly printed paper money) is what is responsible for the current low prices of Gold. Too soon investors will wise up, probably due in part because other Countries Central Banks are now using their own paper USD to purchase Gold (and other PM’s), which will then lead to the value of the USD reversing its current upward trend!